This item is made to order and usually dispatched within 10 working days. Delivery is a further 1-2 working days. 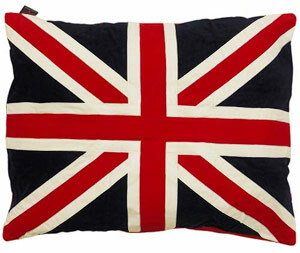 Union Jack dog cushion in red, cream and blue. Spiral fibre dog cushion that has designer style and won't go lumpy. Perfect for patriotic pets and owners. Each individual piece of the Union Jack flag is sewn on, one by one, creating a fabulous multi-layered effect. These are the jewel in the crown of the Dog Doza collection. Dozas are the ultimate in creature comfort while bringing a snazzy designer element to your dog's bed and your home. 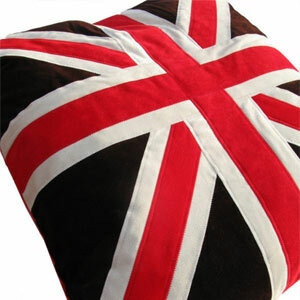 These luxury dog cushions have a gorgeous sewn loose outer cover with strong zip. Filled with 2 separate specially made super squidgy spiral fibre 15 togg duvets that will not go lumpy. Both the insides and outer covers are fully machine washable at 40 degrees. Fleecy underside to keep the warmth in and gives the bonus feature of being double sided. Beautiful, practical and guaranteed to be loved. These dog cushions are the ultimate in dog bed chic. Design - red, cream and blue faux suede backed with red polar fleece. Designed and handmade in the UK. Please note that the sizes are the cushion cover laid flat.